It seems a paradox but it isn’t. I start to think that we should save Scrum from Scrum: from the weight of his popularity that could transform it in something different. More and more often I see Scrum not well understood and applied in organizations. This concerns different aspects: Scrum roles, collaboration of people, estimation, etc. We have already a name for such situations: it’s the well known “ScrumBut”. The real problem is when the “But” part is much more bigger than the “Scrum” part and what is kept it’s just an iterative framework with people playing the Scrum roles and doing some ceremonies with the fundamental agile principles negatively impacted or no more present. You can see development managers playing the Product Owner role instead of someone with business knowledge, ScrumMaster with a subordinate hierarchical link with the PO, Scrum Masters who assign the tasks to people, estimation done by the team with in reality a Gantt Chart already done to tell how things should go… I’m sure you have already seen such situations and many others. Rotating the ScrumMaster Role. I let the team decide. – It is recommended by agile. – It has been done by another Scrum team inside the company and it worked well. Is it really true that the SM role should rotate inside a team? I don’t agree with the idea of having a permanent rule to rotate the SM role specially when it comes from outside the team and those motivations seemed to me not really valid ones. I also clearly remembered what is written in “Succeding with Agile” by Mike Cohn about rotating the SM role. What he says is that the habit of rotating the job of SM is not recommended and it could be done in some occasions and for specific reasons but not as a permanent practice. The risk to rotate systematically the role is that the stakeholders don’t really understand the duties of the ScrumMaster and they can start thinking that everybody can do it. We know instead that to be a good ScrumMaster we need particular skills. Furthermore in companies that haven’t fully transitioned to agile and are mainly organized in a different way (ex: waterfall development) I find that there isn’t always a clear understanding of what a ScrumMaster really is. In such organizations the role of ScrumMaster can be a little different from team to team and it can depend on the context. Sometimes when these companies need a ScrumMaster they need also other skills and other responsibilities and in this case I think rotating the role is even more complicated and risky. Why it worked well for one team inside the company? Why the rotation cannot be applied on every team? The asnwer is simple: every team is different. It’s a mistake to think that what worked well for one team should work well for another and in my particular case between the two teams there were some differences: one team was a cross-functional team with no project manager and working on different functionalities of the application (from UI to DB), the second team was a UI team working in a dedicated UI project with a project manager be also part of the team. The context was different and the role of the ScrumMaster in the two team was a little different too. As we told earlier, the context is important. I didn’t think the motivations were really valid and I didn’t think it was a good idea too to put in place a permanent rotation. I clearly expressed my position to stakeholders but I didn’t want to defend this position alone… I was there to represent the team, I was the servant leader for the team so what the team thought about this? Did they feel the need of this rotation of SM role? I decided to schedule a retrospective meeting with the team, dedicated to the subject of rotating the SM role, to know what the team thought about it and what they wanted to do. The results of the Retrospective have been that the team didn’t feel the need to rotate the ScrumMaster role and they didn’t want to have a predefined rule to rotate it. It should have been a team choice when someone in the team wanted to try the ScrumMaster role. One team member told in the retrospective that he would have been interested to try the role temporarly in view of taking then a CSM certification, but not immediatly. The team agreed also to put in place something to improve the situation when the ScrumMaster wasn’t available (back-up). As a result of the retrospective we added in the team wiki a section dedicated to the role of the ScrumMaster with all the responsibilities and the tasks to do. This guide is actually used as a reference for the back-up ScrumMaster and to give also visibility outside the team on the duties of the role. As ScrumMaster I tried to express my position to stakeholders giving the reasons why the habit of rotating the role wasn’t really a good idea but sometimes is not easy to convince people. In these situations you can do a step back remembering that as ScrumMaster you are a servant leader for the team and you can let the team decide. It’s much more easier if all the team agrees on a position to defend and legitimate it. As ScrumMaster and facilitator of the retrospective I dind’t always follow the full structure suggested in . Sometimes the step to gather the data was skipped and the retrospective just started to generate insights identifying what went well and what we needed to improve. It was a mistake. 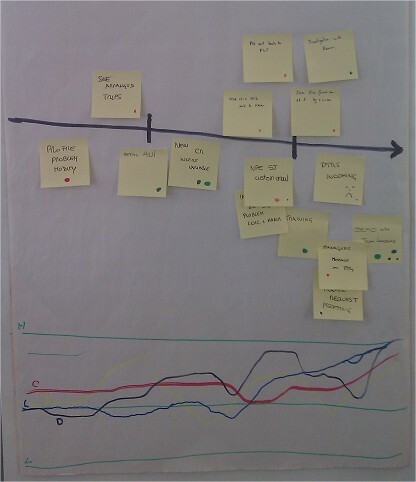 Since some retrospectives I reintroduced again this step and I found that it really helps the team to remember what happened during the sprint: impediments, difficulties, positive moments, feelings. It’s not only important for the team to create a shared vision on what happens but it’s also a way to check how people inside the team consider the same event (positive or negative) and generate discussions. The activity I use to gather the data is mainly the “Timeline”. It’s a very simple but powerful activity to stimulate memories of what happened during the sprint and the aspect that I found really interesting is when the timeline is used to collect not only the facts but facts and feelings. To do this after having collected all the facts in chronological order I ask each team member to put a colored dot to show if they consider the event positive or negative or if their energy was high or low. This part can be considered as another activity called: “Color Code Dots” . Once the facts are associated with feelings we have interesting data to start discussions. I ask why an event is considered positive or negative, I look if all the people put the same feelings or there is someone that consider the event in a different way and in this case I ask why we have this different perspective. Sometimes I ask to draw a graph for the ongoing emotional ups and downs during the iteration. It’s interesting to see again that no all the team has the same emotional status. I found the part that add feelings to the facts really effective because it helps the team focus not only on technical issues related to the development process but on the team and team issues, as it should be for a good retrospective. In conclusion after having seen the difference of agile retrospectives with a step to gather data and without it, I suggest to always find time and do this step. As said by Aristotele: “Well begun is half done”. “Agile Retrospective – Making Good Teams Great” – Ester Derby, Diana Larsen.